Male; Age 40; 5'10''; 155 lbs. Combat Reflexes  (Fright Check: 12); Fit  (HT: +1; Fatigue Loss: Normal; Fatigue Recovery: Double Rate); G-Experience ; Hard to Kill 1  (Note: +1 to HT for Survival Rolls); High Pain Threshold . Bloodlust [-10]; Extreme Fanaticism [-15]; Intolerance [-5] (Towards Zhodani). 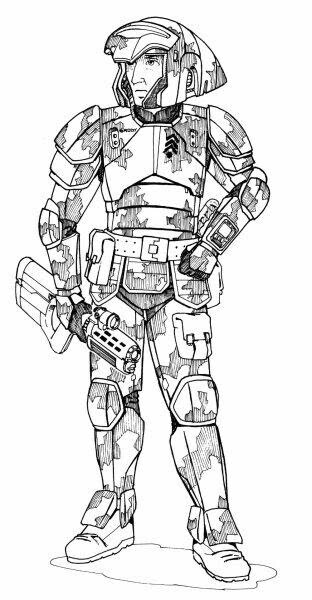 Administration-10 ; Armoury (Rifles and Handguns)/TL9-9 ; Battlesuit/TL9-12 ; Beam Weapons (Laser)/TL9-15 ; Brawling-14  (Parry: 10); Camouflage-9 [½]; Computer Operation/TL9-9 [½]; Cooking-9 [½]; Demolition/TL9-10 ; Electronics Operation (Communications)/TL9-10 ; Engineer (Combat)/TL9-9 ; Explosive Ordnance Disposal-9 ; First Aid/TL9-9 [½]; Free Fall/TL9-14 ; Gesture-9 [½]; Gunner (Beam Weapons)/TL9-14 ; Guns (Light Automatic)/TL9-14 ; Guns (Pistol)/TL9-15 ; Intelligence Analysis-9 ; Interrogation-9 ; Judo-12  (Parry: 9); Knife-12 [½] (Parry: 6); Leadership-11 ; Mechanic (ATV)/TL9-8 [½]; Mechanic (J-Drive)/TL9-0 ; Merchant-9 ; Piloting (Spacecraft)/TL9-12  (Ship's Launch); Savoir-Faire (Military)-10 ; Scrounging-9 [½]; Shortsword-12  (Parry: 7); SIGINT Collection/Jamming/TL9-8 ; Stealth-11 [½]; Tactics-11 ; Traffic Analysis/TL9-8 ; Traps/TL9-9 ; Vacc Suit/TL9-11 . ACR 9mm (cr 7d-1, Skill: 9; 8.6 lbs. ; $1,640; SS: 12; Acc: 9; Half DMG: 560; MAX: 3,400; RoF: 10; Shots: 20; ST: 10; Rcl: -2; TL: 9); BDU, Urban (2 lbs. ; $50; PD: 0; DR: 0; TL: 7); Body Pistol 9mm (cr 2d-1, Skill: 15; $300; Malfunction: Crit; SS: 9; Acc: 1; Half DMG: 90; MAX: 1,200; RoF: 3~; Shots: 6; ST: 8; Rcl: -1; TL: 7); Communicator, Medium Range (1 lb. ; $200; 100 mile range); Computer, Personal (2 lbs. ; $1,000; Pocket Size); Gentex PASGT Helmet (PD 4, DR 5; 3 lbs. ; $125); Gentex Protective Vest (PD 2, DR 5; 5 lbs. ; $200); Head-Up Display (HUD; ½ lbs. ; $500); Jumpsuit ($15; PD: 0; DR: 0; TL: 7); Knife (large) (cut 1d-1; imp 1d-1, Skill: 12, Parry: 6; 1 lb. ; $40; Reach: C, 1;C); Laser Rifle-10 (imp 4d (2), Skill: 15; 9 lbs. ; $1,875; Malfunction: ver; SS: 12; Acc: 20; Half DMG: 4,900; MAX: 9,200; RoF: 8*; Shots: 100; ST: 8; Rcl: 0; TL: 10); Mechanic Tool Kit (Basic; 300 lbs. ; $800); Shortsword (cut 1d+1; imp 1d-1, Skill: 12, Parry: 7; 2 lbs. ; $400; Reach: 1; 1; ST: 7); Uniform, Full Dress (2 lbs. ; $200; PD: 0; DR: 0; TL: 7); Uniform, Low Dress (2 lbs. ; $100; PD: 0; DR: 0; TL: 7); Uniform, Regimental Dress (3 lbs. ; $1,500; PD: 0; DR: 0; TL: 7); Uniform, Utility (1 lb. ; $40; PD: 0; DR: 0; TL: 7).